During the late 1950's Marc Chagall was commissioned to create stained glass windows for the Hadassah-Hebrew University Medical Center Synagogue, located in the Judaean Hills of Jerusalem. One window was to represent each of the Twelve Tribes of Israel, each with a unique composition. Chagall did studies on paper before choosing the final design, to be executed in stained glass. Under the supervision of Chagall, those studies were made into lithographs at the Mourlot studio in Paris and printed in 1962. The Jerusalem Windows project was one of the artist's greatest undertakings and we are proud to offer these beautiful Chagall lithographs. Medium: lithographs (after the watercolors). 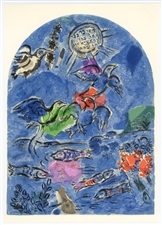 A beautiful collection of lithographs, from the watercolor studies for the Jerusalem Windows, executed by Chagall in preparation for his famous stained-glass windows at the Synagogue at the Hadassah-Hebrew University Medical Center in the Judaean Hills. A different design was created for each of the Twelve Tribes of Israel. Each image measures 8 x 6 inches (203 x 150 mm) and the full sheet size is 12 3/4 x 9 1/2 inches (326 x 243 mm). The designs were transferred to the lithographic stones by Charles Sorlier under the direction of Marc Chagall and these lithographs were printed in Paris at the Mourlot studio in 1962. There is a different composition printed on the back side of the sheet, as issued. Not signed. Medium: original color lithograph. Catalogue reference: M 366. 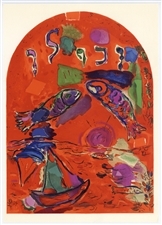 Executed by Chagall for Jerusalem Windows, published by Andre Sauret in 1962 and printed in Paris by Mourlot. Size: 12 3/4 x 9 1/2 inches; 325 x 240mm. Not signed. Medium: lithograph (after the gouache); final design for the "Jerusalem Windows" series. 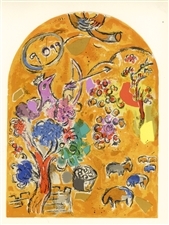 Executed by Chagall in preparation for his famous stained-glass windows for the Synagogue at the Hadassah-Hebrew University Medical Center in the Judaean Hills; a different composition was created for each of the Twelve Tribes of Israel. Image size: 11 5/8 x 8 1/2 inches (295 x 215mm). Not signed. 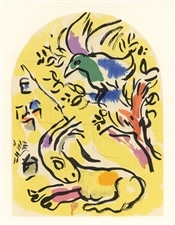 The lithography was done under the direction of Marc Chagall and printed by Mourlot in 1962. Condition: there is a small dark spot in the margin near the top right corner. Condition: the margins have been trimmed, not affecting the image. Condition: there is a bump to one corner of the sheet (in the margin and not affecting the image). Condition: there is a bump to the corner of the sheet, not affecting the image. Medium: lithograph (after the watercolor); first color sketch for the "Jerusalem Windows" series. Executed by Chagall in preparation for his famous stained-glass windows for the Synagogue at the Hadassah-Hebrew University Medical Center in the Judaean Hills; a different composition was created for each of the Twelve Tribes of Israel. Image size: 8 x 6 inches (203 x 150mm); with another litho on verso, as published. Not signed. 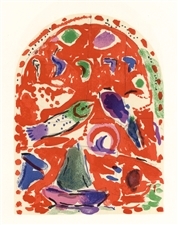 The lithography was done under the direction of Marc Chagall and printed by Mourlot in 1962.